The Long Housen/awork Self-cateringThe Long House near Wells in North Norfolk (sleeps 10) is a minimalist holiday home for lovers of spacious, contemporary living. Conceived by award-winning Hopkins Architects, who designed the Olympic Velodrome, the property has 5 bedrooms, large communal living spaces and both a Morning Yard and Evening Yard for al fresco living at sunrise and sunset. From the upstairs, guests can look across the salt marshes and the sea, and local livestock grazing nearby gives the property the ultimate feeling of tranquillity and submersion in the open space. Only 3km from the sea, The Long House offers an ideal base for easy reach to Wells-next-the-Sea and the sandy beaches at Holkham. 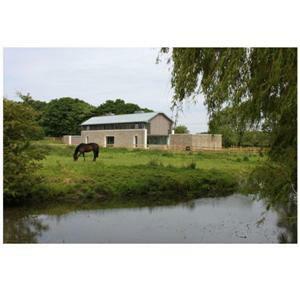 A modern take on a Norfolk barn, the property juxtaposes a traditional double-height entrance gallery with a staircase worthy of a spot in the Tate Modern. Similarly, from the exterior, The Long House is clad in locally sourced flint but in a more modern twist has paving slabs and an annex roof lined with sedum. The Long House near Wells in North Norfolk (sleeps 10) is a minimalist holiday home for lovers of spacious, contemporary living.